As soon as I designed the game that became Panzer Grenadier, I started thinking about a First World War equivalent. We brought out Infantry Attacks: August 1914 in 2010, and when it sold out a while back I decided not to reprint it without major revisions. August 1914 was a very good game on its release (that’s why we sold so many of them), but over the last year or two we’ve upgraded our Panzer Grenadier and Second World War at Sea series with new rules editions, full-color play aids and new packaging. So it seemed like a good time to do the same for Infantry Attacks, both for August 1914 and for the upcoming Fall of Empires and Lawrence of Arabia. August 1914’s package now uses the same sleeve-and-plain box approach as almost all of our other boxed games. Infantry Attacks is our series of games based on tactical combat in World War One. Units are infantry companies, cavalry squadrons and artillery batteries. Leaders are vital to activate those units, and move them toward the enemy. Each hex represents a piece of ground 200 meters across; each turn, 15 minutes. The game is designed to be interactive, but the side with better initiative usually gets to do more things. So far, August 1914 has been the only release. August 1914 is tightly focused on a single campaign, in this case the early fighting in East Prussia between the German Eighth Army and the Russian First and Second Armies, including the battles of Gumbinnen, Tannenberg and the Masurian Lakes. These are the early days of the Great War, with both sides as close to full strength as they’ll ever get and sending the professional core of their armies into action (which the Germans supplement with reservists and even aging Landwehr men). They both still field lots of cavalry, and the situation’s fluid enough to get the horsemen into action even in the fairly dense woods and swamps of East Prussia. I put a lot of research into August 1914’s scenario design, burrowing into the “dusty old tomes” to craft a full story told through game scenarios – the sort of result I now want from all of our tactical games. Depression had something to do with that, as the research provided a welcome escape from the real world and it might not have been the healthiest mental exercise. But it did provide a comprehensive picture of the campaign in East Prussia, and I’ve tried to do that again (without the depression part) in games like Fire in the Steppe. August 1914’s scenario set is exactly what I wanted it to be. For the second edition, I’ve tweaked them a little to match the Infantry Attacks Second Edition rules (see below). Most importantly, I’ve re-organized the presentation so the game could add “battle games,” an innovation developers Matt Ward and Danial Rouleau introduced for Panzer Grenadier that give players a broader set of goals when playing a sequence of scenarios. So, for example, the sequence of scenarios in which the German I Corps tries to delay the advance of the Russian First Army now has a set of victory conditions for play over all of the scenarios – not just how many scenarios one side wins, but often how they are won (key locations held, delays inflicted or rapid advances made). Together with new historical intro sections for the battle games, that ties the scenarios together and strengthens the sense of historical narrative. That’s something you can’t get in the old-school shotgun approach of scenario design (with a little taste of different stuff here and there, and maybe a paltry 10 or 12 scenarios). For the most part, I liked the first edition rules for Infantry Attacks. I thought they handled infantry and cavalry combat well, and the importance of leadership to fire and movement. All of those rules concepts draw heavily on Panzer Grenadier, and it would have been surprising had they not worked well given that series’ long history with dozens of books and games and thousands of scenarios published and played. The artillery subsystem for Infantry Attacks disappointed me. It changed substantially during development, and while it needed to change, I’m not convinced that the one we published is that much better than my original draft (it’s just flawed in a different way). The problem lies in forcing players to write stuff down (in this case, the target hexes for pre-plotted artillery fire), which takes a great deal away from the fun and I’m not convinced is particularly accurate in simulation terms, either (at least for the mobile battles of 1914). So we’ve switched to a simpler system that does away with writing stuff down. Panzer Grenadier is supposed to be both intuitive to play and interactive, and that needs to apply to Infantry Attacks as well. We also have some rules changes for field guns, the German 77mm, Russian 76.2mm and Austrian 76.5mm (8cm in Austrian parlance) batteries that make up the overwhelming majority of the artillery on the Eastern Front in 1914. I recognized that these needed to be treated differently when I wrote the first draft of the series rules, but didn’t present it very well and in development they became lumped in with all artillery just like Panzer Grenadier. That’s not how they were used in the opening days of World War One, and they definitely shouldn’t show up as off-board artillery (which I mistakenly did in some scenarios). For the second edition, I’ve moved all the off-board field guns onto the board (fortunately, the August 1914 set of pieces includes plenty for each side). Once there, they’re deadlier than they were in the first edition as befits the god of war, though they remain pretty vulnerable if you try to use them as very slow panzers. And we’ve moved the revised charts onto color cards just like Panzer Grenadier or Second World War at Sea. You don’t really need these, but of course you need these – it just makes playing with the game that much more fun and lets you know you’ve moved past the 1970’s in terms of game production. The rules themselves are still printed in beautiful black-and-white, because I remain opposed to wasting my money and yours on stupid fripperies like a full-color rulebook. For a very brief time, Gold Club members can get a set of the new series rules plus the new scenario book separately. Once that window closes, we’ll never, ever offer that again (arranging the printing for extras is fairly painful, and I dislike pain). 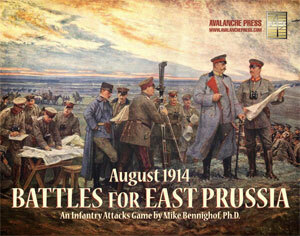 Don’t wait to put August 1914 on your game table! Join the Gold Club and find out how to get it!